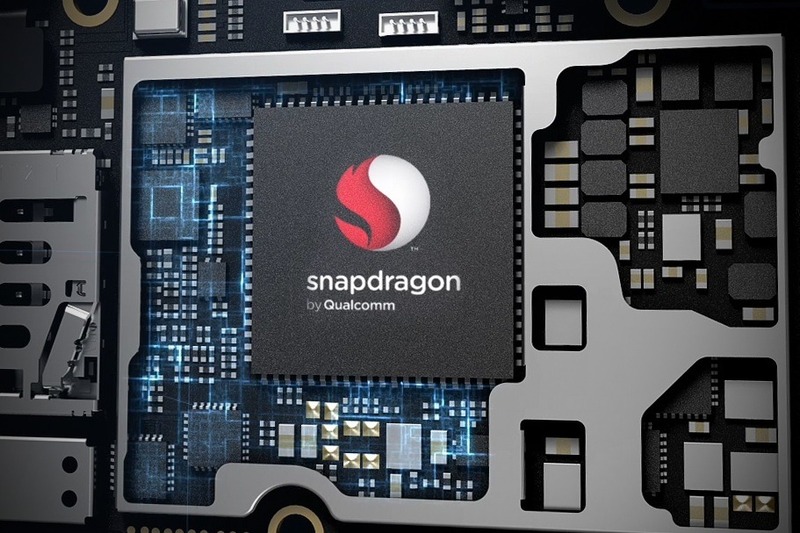 Snapdragon 435 was the last 400-series chipset from Qualcomm launched in February 2016. It’s been quite some time now since we have seen a new 400-series processor from Qualcomm. Today, Qualcomm finally announced an upgrade to the Snapdragon 435 at the Mobile World Congress Shanghai. Named Snapdragon 450, this is based on the 14nm FinFET process that brings enhancements in Battery life, graphics and performance. In fact, the 450 is the first processor in its series to be built on the 14nm process as all the previous 400-series processor are built on the 28nm process. SNAPDRAGON 450 VS SNAPDRAGON 435 – WHAT’S IMPROVED? Well, we have already talked about the biggest difference between these two chips, and that’s the process on which they are built. The Snapdragon 450 has got a higher clock speed (up to 1.8GHz) a compared to the 435 (up to 1.4GHz). Also, this processor now supports 60FPS video recording, Dual Cameras, USB 3.0 and also the Quick Charge 3.0 technology. With every new Qualcomm chip, comes a new GPU. So, the Snapdragon 450 comes with Adreno 506GPU with 25% faster Graphics rendering and 30% less power compared to the GPU of Snapdragon 435. 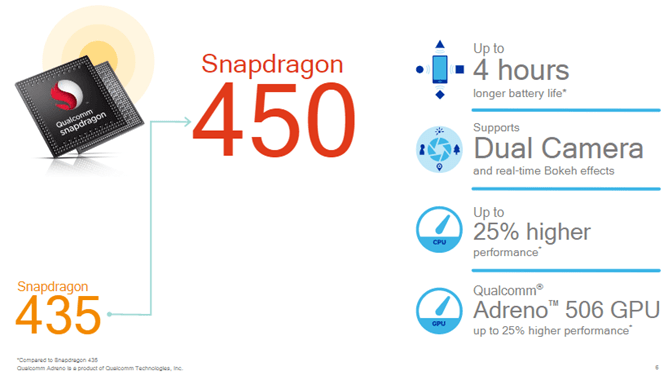 With the 450 chip, Qualcomm guarantees up to 4H longer battery life and 25% higher performance as compared to the Snapdragon 435. As mentioned before, the dual camera support is finally arriving with the 450. Lastly, talking about the availability, Qualcomm has mentioned that the phones with this chipset will arrive in Q4 this year, so it seems we won’t see any Snapdragon 450 powered device until October. Improved CPU and GPU: Higher performing octa-core ARM Cortex A53 CPU results in 25 percent increase in computing performance compared to its predecessor. 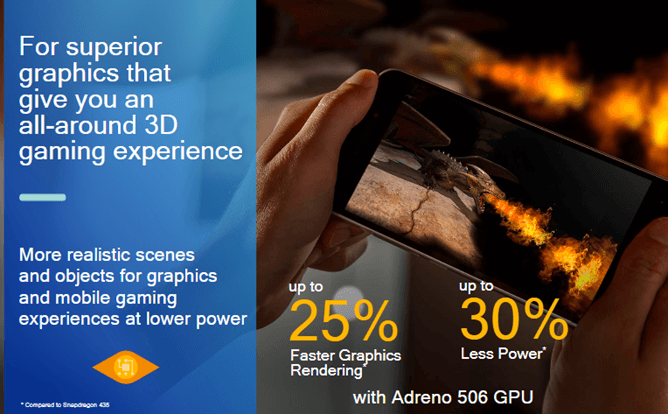 Additionally, the integrated Qualcomm® Adreno™506 GPU delivers a 25 percent increase in graphics performance over the Snapdragon 435. Battery life: Power management improvements result in up to four additional hours of usage time compared to the Snapdragon 435, as well as up to a 30 percent reduction in power when gaming, helping consumers stay connected and productive for much longer.The Snapdragon 450 also comes with Qualcomm® Quick Charge™3.0 support, which can charge a typical smartphone from zero to 80 percent in about 35 minutes. Camera and Multimedia: The Snapdragon 450 is the first in the 400-tier to support real-time Bokeh (Live Bokeh) effects.It is also designed to improve on previous generations by including support for enhanced dual camera at 13+13MP, or single camera support up to 21MP; hybrid autofocus; and 1080p video capture and playback at up to 60fps, enabling slow motion capture.The Snapdragon 450 also includes support for 1920×1200 full HD displays, as well as the Qualcomm®Hexagon™DSP, which enables multimedia, camera and sensor processing at greater performance and lower power than the previous generation. Connectivity and USB: Users will enjoy fast LTE connectivity with the Snapdragon X9 LTE modem, which utilizes 2x20MHz Carrier Aggregation in both downlink and uplink for peak speeds of 300 Mbps and 150 Mbps respectively, support for a large number of mobile networks with Snapdragon All Mode, and 802.11ac with MU-MIMO support. The Snapdragon 450 also supports USB 3.0 which is first in its tier to support fast USB data transfer. To date, more than 1900 designs have launched or are in the pipeline across the Snapdragon 400 tier mobile platforms. The Snapdragon 450 is expected to begin commercial sampling to customers in Q3 2017 and is expected to be available in consumer devices by the end of the year.